The Internet has been changing the way we lead our lives. It also had a significant impact on our workspaces and professional encounters. It is said that employees are the greatest asset of a business. Employers use all possible sources including LinkedIn to explore new talent. Personal comments and profiles on social media may be tracked to assess the suitability of a candidate while also opening a Pandora’s box of issues related to privacy, gender rights and remuneration. 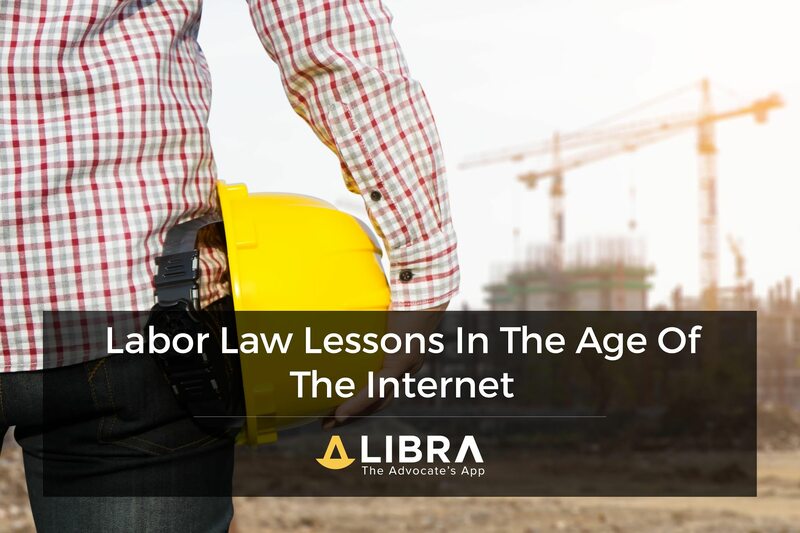 In this post, we highlight important dimensions of the impact that the internet has had on labour laws in India. With the internet, the opportunities for working from home have greatly enhanced. However, a report on the OECD member countries working conditions reveals that the internet has induced a high level of temporary and short-term workers, with no protection and social welfare advantages attached to their position. India, being a country with a massive population engaged in the outsourcing industry with remote employees presents a greater risk, as these workers may be entrenched without due processes (like notice, compensation, insurance, gratuity and PF contribution etc) enshrined under several labour laws. A recent poll revealed that 70% of hiring managers have said they have rejected a job applicant based on information they found online. Till some years ago, it was criminal background, credit records and past employers that were used to trace the antecedents of an employee, however, in the age of the internet, a social media background check is slowly assuming greater importance. Employees have also reported changing names on the internet to protect their privacy. Some employers may use different mechanisms including online behaviour tracking to identify favourable and unfavourable traits in employees based on their affiliations over the internet, their comments, pictures and personal emails. This may also be classified as an abuse of consent required for privacy surveillance. While there exists no labour law in India prohibiting this, we may loosely trace this obligation under the Information Technology Act that necessitates protection of sensitive information. However, it may still be debatable whether using this information for internal purposes by a company without any disclosure can amount to the abuse of law. The internet, with its mass reach and ability to give an undeterred voice, has played a greater role in enhancing awareness towards preventing cases of verbal, sexual and physical abuse at workplaces. Campaigns like ‘MeToo’ encouraged women to come forward and have influenced the setting of strict standards of workplace behaviour. The Ministry of Women and Child Development has also launched an online complaint box (called SheBox) for employees facing sexual harassment. It is believed that this digital space would enable speedier resolution of cases. Another positive impact of the internet has been the use of online services for transfer of amounts to social welfare schemes like Gratuity, PF and also an instant transfer of money to salary accounts at the click of a button. This has also made the accounting element of the salary component more transparent and less prone to falsification for tax purposes. What procedures should a company put in place? It is also not undeniable that employees may misuse the internet to leak classified information or commit crimes like phishing, hacking or cyber harassment. Thus, it is important for companies to brief employees on responsible use and their accountability. A company should also routinely undergo an IT systems audit to ensure the safety of its operations and records. Additionally, a company can secure its workspace using firewalls while also exercising security procedures for cloud use, downloads and file-sharing.